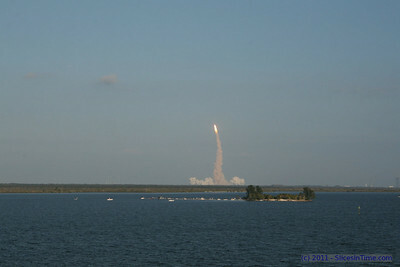 Thursday, Feb 24, 2011 / Kennedy Space Center Florida -- We were lucky enough to view the launch of Space Shuttle Discovery launch on Mission STS-133 from Titusville, Florida. This is the second launch we've seen now and there is only one or two left in the entire Shuttle program. It is a very exciting experience, shared with thousands of other fans. There is lots of anticipation leading up to it and it's all over in a matter of a about 3 minutes. This time, we drove to Titusville from our RV resort on the southwest side of Orlando, about 73 miles away. It took us about 2-3 hours to get there with some heavy traffic in spots. But on the way home, we were stuck in the worst traffic jam I've ever seen. And I grew up in Los Angeles! It took 7 full hours to drive 73 miles. All in all though, it was worth it. The photos are posted on our SmugMug site and there is a little slideshow and video posted here.